So many new features for you to enjoy! New Exterior and Interior paint in 2018. New hickory Kitchen cabinets and new counter tops 2015. Newer carpet. 6 panel doors. New light fixtures. Custom wrought iron railing. Vaulted ceilings. Skylights, ADT Security system. 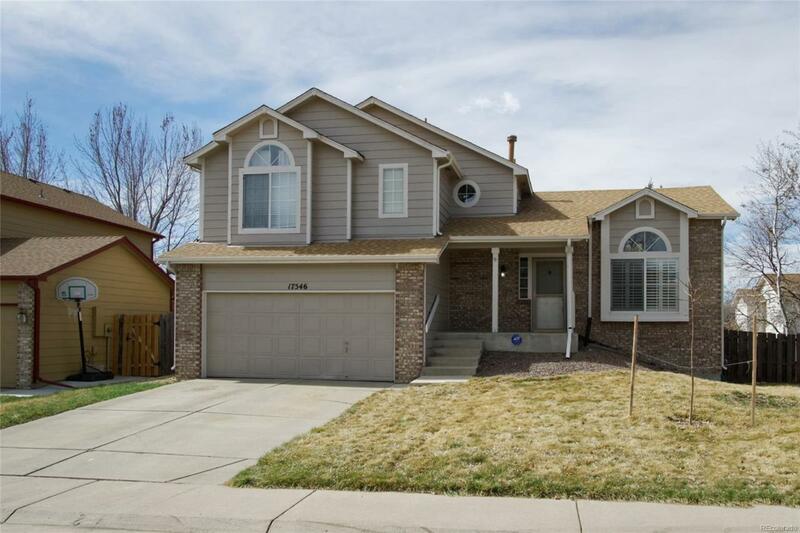 Luxurious 5 piece bath in Master bedroom, convenient upper level laundry, cozy gas log fireplace in spacious family room. All appliances and window coverings included. 10 X 12 Trex deck - great for summer cook outs. Sprinkler system. Fenced yard. A/C and furnace new in 2017. Newer water heater. Build equity by designing and finishing the open basement with rough in plumbing in place. Quiet cul de sac location. Less than 1 block to park with walking path to duck pond and walking distance to a new recreation center, across the street from Rangeview High School, scheduled to open August 2018. Walking distance to Vassar Elementary. Pet free, smoke free and definitely in move in condition. Offered by 1ST REAL ESTATE GROUP.